Sprinkle the chicken with ¼ cup Fire Roastin’ Cajun Seasoning. Preheat a gas or charcoal grill on high (375°F) for 15 minutes. Reduce the grill heat to medium-high (350°F). Oil a clean kitchen towel and use tongs to coat the hot grill grate with oil. 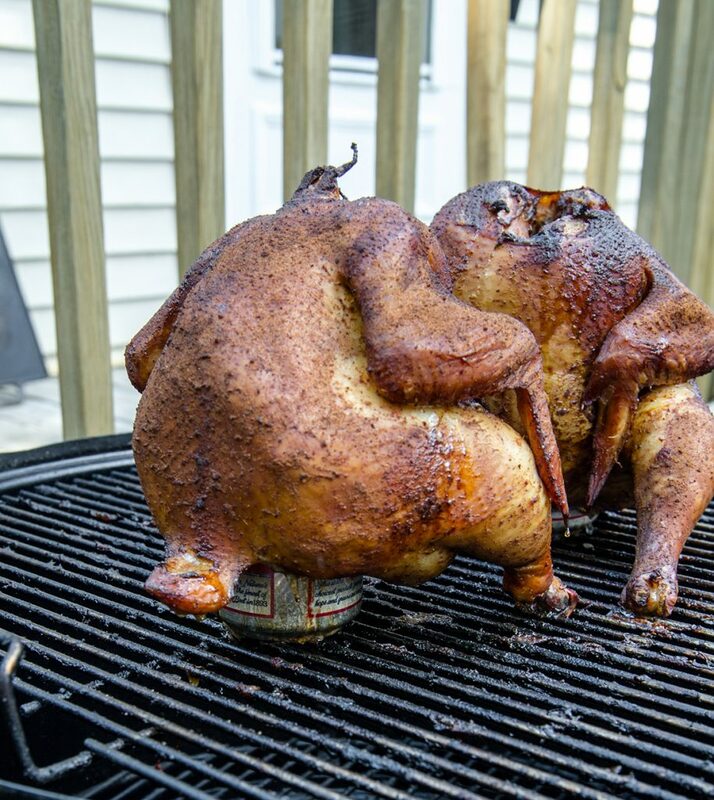 Use tongs to place the chicken on the hot grill grate. Cook the chicken, uncovered, about 15 minutes, turning once halfway through cooking. Cover the grill and cook the chicken 8 minutes longer or until an instant-read thermometer inserted into the chicken reaches 160°F (internal temperature will rise 5° to 10°F upon standing). Transfer the chicken to a cutting board; loosely cover with aluminum foil and let stand 10 minutes to allow juices to redistribute. In a small bowl, stir the Caesar dressing and the remaining 1½ teaspoons Fire Roastin’ Cajun Seasoning. In large bowl, toss salad greens, tomatoes and Caesar dressing mixture. Place chicken on the bottom buns. 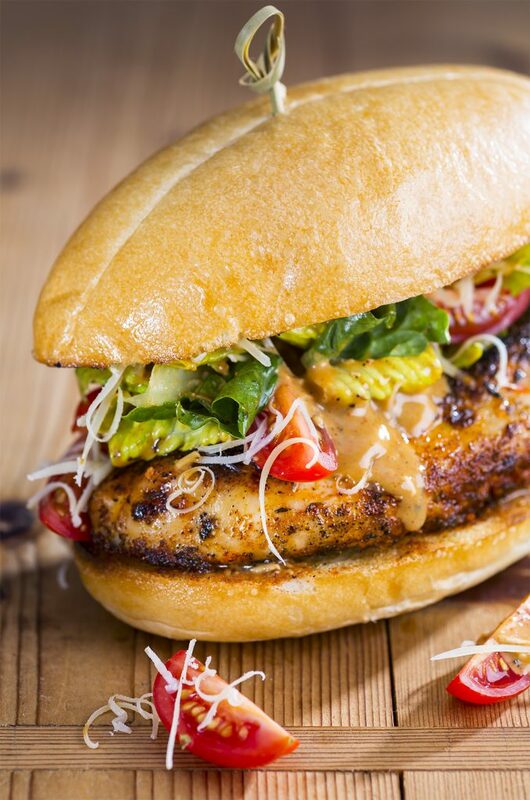 Evenly top chicken with Caesar salad, Parmesan cheese (from salad kit) and top buns. 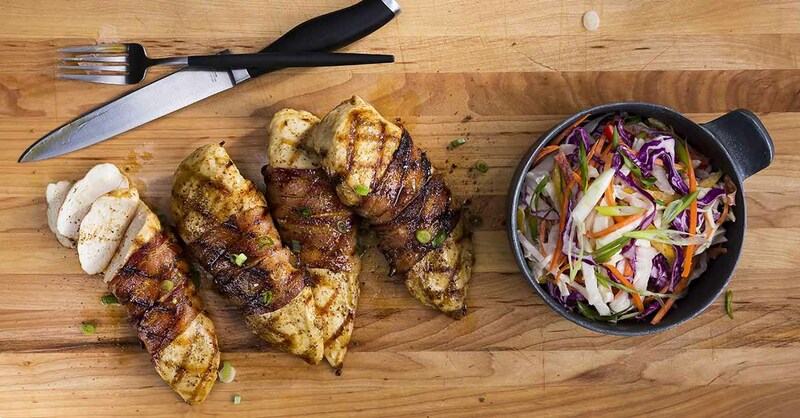 Use 1 teaspoon Fire Roastin’ Cajun Seasoning per 7- to 8-ounce chicken breast. Perfectly cooked chicken should feel springy when pressed and the juices should be clear without any reddish tone. To cook the chicken breasts on the stovetop, heat a large skillet over medium-high heat. Add 2 tablespoons olive oil to skillet and reduce the heat to medium. Add the seasoned chicken breasts and cook, partially covered, 15 minutes or until an instant-read thermometer inserted into the chicken reaches 160ºF, turning once halfway through cooking.